This Ian Brown FEAR pencil drawing has been designed by Mark Reynolds. It also features the lyrics from the song FEAR. Using the best printing process (Direct to Garment) we are able to reproduce this drawing onto T-Shirts and Hoodies. One of my main influences for my Ian Brown FEAR pencil portrait came after reading one of Ian Browns books. Brown stated his main influence for FEAR was taken from a Malcolm X autobiography which preached the study of etymology (for example) ” For Each A Road ” . 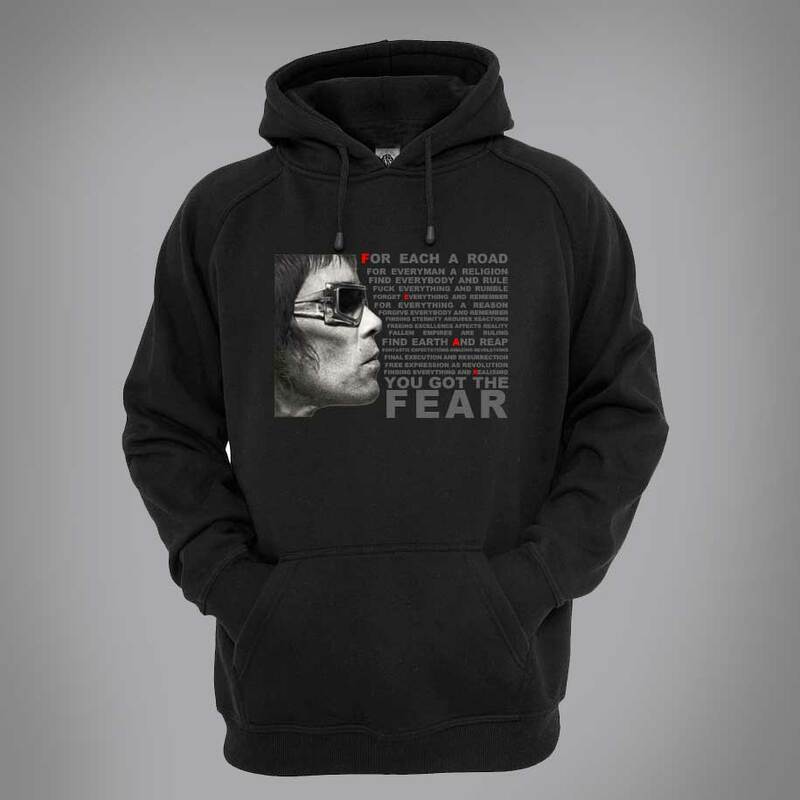 Ian Brown went on to create hundreds of acronyms from the word FEAR. You can see more of an insight into the meaning of the Ian Brown FEAR song by watching the Ian Brown FEAR video, one of the coolest music videos ever made, you will see why. Other Pencil drawings like the Ian Brown FEAR piece are also available in a limited edition print . A Young Ian Brown, King monkey and Ian Brown early Roses are other portraits I’ve produced for my Ian Brown pencil edition. T-shirts and hoodies are also available with your favorite Ian Brown , Stone roses artwork on them all 100% cotton and available in a range of colours and sizes.